For those of you who might be new to my blog and have not read Part 1 of this series, I ask that you scroll down and read it before reading and commenting on Part 2. Thank you. 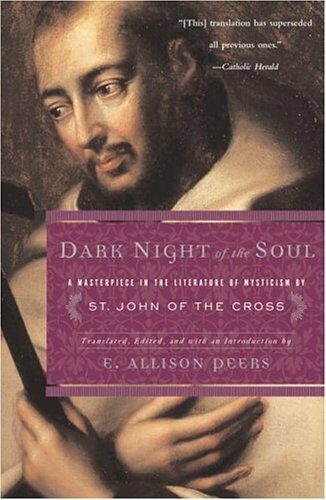 The book I felt so drawn to pick off the shelf was called, Dark Night Of The Soul by St. John of the Cross. “The Dark Night of the Soul is when we are beleaguered by darkness: spiritual and mental and where no hope seems to be near and everything we try to do is thwarted. 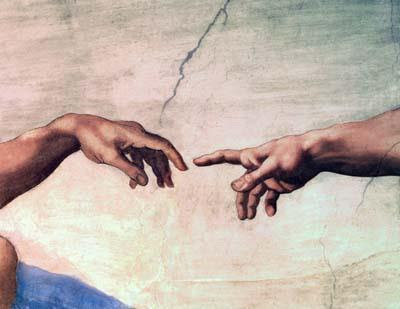 It is where the soul is forced to persist and enter into the illumination and kinship with God. For the first time in having moved back east, this book began to point me in the right direction to some clarity. I began to see that what I was going through on a human and physical level, had more to do with a spiritual process that was bringing me closer to what my soul wanted - to be stripped bare, so that I would have only the power of God to rely on. Allow me to share here, that I think on some level I asked for this experience because about a year before all this happened, I was in a deep meditation one evening and clearly remember saying to God, "I want to know you. Deeply"
Do I have proof that I actually went through the dark night of the soul? No, I don’t. But I know in my heart that I did. The dark night of the soul lasted two years for me. They say that each person experiences it in a different time span. Some longer, some shorter. Walking through the dark night was perhaps the most frightening and vulnerable experience I have ever been through because I had to go through it alone and trust my intuition. Or rather, trust the promptings of God to lead me. So many things happened to me during that time, which would take far too long to explain. But let’s just say everything that could possibly go wrong in my life, went wrong. Yet looking back, these things weren’t wrong….they were exactly right. I lived day by day, moment by moment. Not knowing what was ahead, or knowing when this dark night would finally be over. Little by little, I could feel myself gaining interior strength. I slowly began to feel lighter and clearer. I began to feel my humanness and spirit merge. I no longer felt separated. The best way I can describe this in one word would be that is was like a marriage. A union of my soul with God. Gradually, everything started to turn around and I regained a calm sense of spiritual stability. I had to know darkness, so that I would know light. I had to go through being stripped of everything I thought was power, to learn what true power is. I had to be totally alone, to learn that I am never alone. I had to be blinded, in order to learn faith. I had to learn what it was like to be small, so that I would know humbleness. I had to learn that no matter what challenges life may toss my way, I will be provided for. And most importantly, I had to lean what my relationship is with God. To surrender. And to allow my purpose to be His purpose. Now even though I went through this and learned these things, that doesn’t mean I still don’t struggle. Also, going through this does not mean I no longer have challenges or experience fear. However, there is a big difference in how I now struggle with challenges in my life, than how I use to struggle with them years and years ago. Because I now know that whenever I’m struggling with challenges or fear, I‘m really only struggling with my limited human mind. And as terrifying as this experience was for me, I look back at it as one of my greatest blessings. Because now I finally see. That I am always loved. And I am always safe. First off, Thank you for sharing your life experience with everyone. I think that to know you truly is to also know that this period took place. I say that it happened because of course, you believe it inside your heart of hearts. It is all about what we feel and if we are in tune to God/ the universe or not. This is getting back to the basics of life, just like we were born again. Isn't it nice to find your place in the universe? I think that to be humbled is something that we all need. Happy Monday, have a great day. Now that you've told the title of the book, I remember your telling me it a while back. Thank you, Ron for sharing your story. You give hope to many. Thanks so much for sharing such a personal experience with us. I so love and understand most of those truths. You have to know darkness before you can know light. SO TRUE! I loved this. Have a wonderful week my dear dear friend. I wanted to wait to comment until after reading both parts. That was very powerful. I completely agree with the part about needing to feel totally alone to realize you are not. That was something I had to struggle with in my early twenties. Suffice it to say, I had an epiphany one day that I am fundamentally alone and separate from anyone else. That was the scariest realization but most empowering one I ever had. It allowed me to recognize that seeking out other people to take care of me so I wouldn't be alone was always going to lead me down the wrong path. Thank you for sharing this. Enlightenment is never easy. Ron, that was fabulous. Thank you so much for sharing this deeply personal experience. "I had to know darkness, so that I would know light." Fabulous! Thank you for your kind words, my friend. "This is getting back to the basics of life, just like we were born again." RIGHT ON, BARB! This experience felt exactly as if my soul had been 'reborn' again. "Isn't it nice to find your place in the universe? I think that to be humbled is something that we all need." Yes it is. And I use to think that my place/purpose in life was only ONE thing. However, after going through this I see that my purpose is MANY things. And they change as my life moves forward. And yes....I NEEDED to be humbled. It did me good. Thanks oodles for stopping by, Barb. And thank you for your support.
" The darkness is definitely where God's guidance steps in. It's where we learn to grow, to cope, to be happy and content. I had a personal experience where God used his great influence. It's a powerful thing." You said it!!! It's where we learn to grow, to cope, to be happy and content." And honestly, if I hadn't had this experience I truly think I would have never understood that. It's as you shared.....a POWERFUL thing! Thank you soooooooooooooooo much for stopping by and for your support, dear lady. Muchly appreciated. And one day I would LOVE to hear about your experience. Yes, I think I do remember telling you the title of this book a while back in one of my comments on your blog. You are so welcome, my friend. And thank YOU for stopping by and for your support. I've always felt that you and I somehow feel the same way about paths with God because of so many things you've shared on your own blog. We're kindred. You're so welcome. And thank YOU for stopping by and for your loving support. "You have to know darkness before you can know light. SO TRUE!" It's funny, I spent years avoiding my darkness because I thought it made me a horrible person. But in all honestly....I never got to truly see my light until I embraced my darkness. We all encompass both - light and dark. Our shadows. Again, I thank you so much for stopping by! OMG....what you said about your epiphany was the same for me!!! We're like two peas in a pod. "Suffice it to say, I had an epiphany one day that I am fundamentally alone and separate from anyone else. That was the scariest realization but most empowering one I ever had. It allowed me to recognize that seeking out other people to take care of me so I wouldn't be alone was always going to lead me down the wrong path." You said it! That's one of the most scariest, and yes, also empowering realization. To realize, that YES, we ARE alone and separate from anyone else, but at the same time....NOT alone. "It allowed me to recognize that seeking out other people to take care of me so I wouldn't be alone was always going to lead me down the wrong path." I totally 'get you' Jen! Thank you soooooooo much for stopping and sharing on this post. I so appreciate it! P.S. can't wait to see you next month so we can talk more about this. You're so welcome, m'dear. And thank YOU for allowing me to share it. Another hearty AMEN, Ron. Very good testimony about God working in your life!
" it is not the struggle that can paralyze us but the way we deal with the struggle." For me, my struggling was always limited because I could only see it with my mind. However, when I brought that struggle down to my heart....I began to see it completely different. And ironically, discovered a solution. Thank you so much for stopping by and for sharing yourself in this post. Also, thank you for your open heart! You are so welcome. And thank YOU for reading this with an open heart and understanding. Once I embraced my darkness....I was able to see my light. Have a wonderful week, buddy! Thank you for stopping by! I have been going thru some things for awhile that have been difficult like those you speak of. I've had experiences before and come out of them with a renewed sense of spirituality but I cannot say I'm currently there with what's happening lately. I still am trying to remain open to the process though and thank you for your openness about things you've gone through. And thank you for stopping by and for your support, dear lady! "I have been going thru some things for awhile that have been difficult like those you speak of. I've had experiences before and come out of them with a renewed sense of spirituality but I cannot say I'm currently there with what's happening lately. I still am trying to remain open to the process though.."
I can say this to you because you are also a Reiki practitioner. This all happened to me about a year after I had my second Reiki attunement. As you already know, Reiki has a way of opening you to experiencing some pretty intense stuff - inner house cleaning - going through the dark night was part of my process. Like I shared, I don't feel that everyone has to do through this, but I did. And if it hadn't been for the Reiki sessions I had during this experience, I don't think I could have gone through it with as much understanding. So keep the faith, my friend. You'll move through it, I know you will. Thank you so much for stopping by and sharing. Muchly appreciated! Have a wonderful week, M! Thank YOU for sharing with US, Ron. There's an old saying that goes, "It's darkest just before the dawn" and your post perfectly sums that up. Sometimes you do have to hit rock bottom in order to not only be able to claw your way back to the top, but to appreciate the view once you get there. I'm a big believer in spiritual growth, and the whole "everything happens for a reason" philosophy. Sounds like you are, too. "There's an old saying that goes, "It's darkest just before the dawn"
Hey, I never even thought of that saying applying to this experience, but you're spot on! "Sometimes you do have to hit rock bottom in order to not only be able to claw your way back to the top, but to appreciate the view once you get there." And after experiencing this, I agree! "I'm a big believer in spiritual growth, and the whole "everything happens for a reason" philosophy." As always, Mark, thank you for stopping by and sharing your wit and wisdom. Muchly appreciate it, bud! Oh Ron, I cannot thank you enough for posting this. As I am in a VERY dark place right now. I am trying to sound positive online and on my blog, but the reality is I am NOT doing very well. I will definitely get a copy of "The Dark Night of the Soul" because I am willing to try anything. As you already know, Mo and I went through a similar thing. Ours lasted longer, mainly because most of what we went through was caused by others and they had to be 'seen through'. One of our lessons, I think, was to realise that we can rely on nobody else to help us out of our dark pit. It had to be done by us alone, with guidance from God. Once we were out and clear, we had heaps more confidence in what we could achieve. The only time things went wrong was when we allowed people to guide our direction instead of God. And I thank YOU for being so open in reading my story. I know how you feel right now, because I'm so familiar with that dark place. Just know that you WILL move through this - you WILL - just keep the faith, my Libra friend. I will email you my phone number tonight when I get home, so if you would like to talk on the phone, we can. Sometimes it helps to just talk. I'll leave that up to you if you feel okay with that. I soooooooooooo hear ya, dear lady!
" One of our lessons, I think, was to realise that we can rely on nobody else to help us out of our dark pit. It had to be done by us alone, with guidance from God." And that was perhaps the hardest part of this dark night for me. To learn how to 'hear' and 'trust' God. "The only time things went wrong was when we allowed people to guide our direction instead of God." Meeeee too - and not only back then, but even now sometimes. Ultimately, the direction has to come from our own hearts. I can't thank you enough for sharing your own experience in this post, Babs. You ROCK, girl! And please thank Mo for me too, okay? Okay--that gave me one of those 'G-d hugs' just reading about what you walked away with from the experiences. I can share about the 'ego busting' that had to happen for me. Bit big for my britches, I know.....it was ALL about mememe. Where's MINE? What's in it for ME? *sigh* Bit of a selfish snot, I was. k...HUGE selfish snot. I could make it LOOK like it was unselfish and caring, but geeze--I had sucky motives and justified it (cuz if you had MY life....oy, HUGE snotbucket--I'm almost embarassed to own that, but it's good for my ego TO own it, so there ya have it!). It's good to get 'right sized'....note I didn't say 'comfortable and fun', but 'good', cuz it's been 'good' for me to get 'small'. It's the staying small that's needed--and that happens for me every time I get to just tell the truth about the places I've wandered and the decisions I've made (good, bad and ugly.....). I was one of those 'all the blame and none of the glory' kinda gals. If it turned out well, it was MY hard work and MY doings--if not....G-d was picking on me and mine. *sigh* Did I mention I had a bit of an ego problem AND a bit of a grudge with G-d?! Yeah, well......I did. We had to work through that one--and did.......thankfully. He chased me with a passion so we COULD work through that one cuz THAT'S how much He loves me. Ironically you used the world 'marriage' in trying to define/describe the relationship between you and your G-d. People look at me sideways and think it's an 'ego' thing when I say I entered a marriage with G-d. It's the best description I can give. I started one of those 'boy meets girl, girl toys with boy and considers going steady with him--and then boy does screwy things and seemingly ditches girl who gets stinking crabby about it until boy tries to get girl back and girl makes that darn near impossible JUST to teach boy a lesson by golly, by gumption....and then suddenly girl finally gets some perspective, the lightbulb goes off and she falls madly in love etc etc et al--and they live happily ever after blah blah blah'--yup, THAT was the deal I had going on with G-d. Seriously--it was like a bad romance novel with the ins and outs of being chased with a PASSION by a G-d I was resentful and angry with for ditching me and leaving me to fend all on my own thankyouverymuch!! I ended up married to Him. How could I not when He chased so hard and so long to let me know how special and loved I was/am. So we have this marriage, me and G-d.
And I was so satisfied--so much so that I wondered how entering into a human marriage might compromise my spiritual marriage with G-d.... I darn near said NFW to he-who-had-to-be-nutz-to-marry-THAT-one!! Seriously, I almost chucked the whole deal because I didn't want to compromise my relationship, my marriage with G-d......cuz I really was at a place of contentedness and peace. For the record, that's not been compromised..nor has it diminished the passion and love shared in my relationship with My Maker. *laughing* Here I am going on and on and on again.... GO figure! You have my love and respect for sharing what you shared here. And you have a bit of validation (maybe)--for the 'married to G-d' deal. If YOU don't feel validation, lemme tell you I do....so that's a good thing. An empowering, affirming thing. I ain't as weird as I thought I was? But it's good to know there's someone else JUST as weird as me! we can sound any way we want as we put forth our 'blog face' (mine is often so far from where i am....) yet what you have shared is so deeply intimate and personal, i would have feared to open myself as you have....but i am so moved you have the courage to tell your story to me, to the world....in reading this treasure about your own path, i now see why you have such deep compassion for others. Okay...I first have to say a HUGE thank you for sharing all that you shared in your comment. WOW....thank you! thank you! thank you! And I don't know whether it's because we are both Libra's (I know, I here I go again about the Libra stuff), but you and I have many of the same lessons, so I hear ya, dear lady, I hear ya! "Ego busting" Yup....I know that one well - HA! And it's as you shared, it was good for me to be 'small' because I honestly never knew humbleness. It's funny how much I THOUGHT I was in control and had power, until I had none. How IRONIC!!!! Something happened to me a year later after this experience (which I may share in a future post later on down the road) on WHY I used the word 'marriage.' It happened to me the week I was on a solitary retreat in the Pocono Mountains. It was an experience that 'sealed the deal' between God and I. It was amazing. "I ain't as weird as I thought I was? But it's good to know there's someone else JUST as weird as me!" No, my friend....you're not weird at all. Well...if you are, so am I - HAHAAHAHAHAHAHAAHA! Again Mel, thank you so much for adding your own life experience to both these posts because you added MUCH. I think there's a reason why you and I met some FOUR years ago in this wonderful blogland. And I am so grateful that our paths have crossed. Thank you so much for your encouraging and sweet words, dear lady. For some reason, I felt ready to share this now. Something inside said to share it because it might be helpful for others who may be going through something similar. But I have to say, I WAS fearful of sharing this because whenever you bring up the topic of God, people sometimes get uncomfortable and don't know what to say. So, I'm glad you enjoyed it and that it touched you on some level. "to feel i am not alone in this i am currently trying to get through...if ever.... i often think i never will and become suicidal, to be honest, given such dreary health problems, and yet, this does give me hope." Even though you and I have different challenges, I DO understand your frustrations and all the feelings that go along with them. And yes, like I shared with Babs, during that time I did understand why people think of suicide. But, I think that was part of what I needed to feel and look at because I could never IMAGINE myself feeling that way, but I did. Again, it was to show me humbleness. From reading your last few posts, and where you are right now on your spiritual path, this book might be something worth looking at. Like I shared, it's a book that not all wrapped in a pretty pink bow, nor light and fluffy. It's intense. But in a GOOD way. thanks for sharing, ron. have a happy monday. Yup...that was something I truly needed to learn. Up until that point I think I thought I had everything under control and had all the power. You are so welcome, girl. And thank YOU for stopping by and sharing. It takes a big man to share an experience like this. Thank you, Ron! I'm off to check out this book! Thank you, not only for your sweet and kind words, but also for your open heart. Thank you, buddy! It's been a joy and honor to meet you. X to you, Karin and Mr. Tyler! I just love that one part where you said 'I had to be totally alone to learn that I am never alone.' I love that. It says so so much. I appreciate the way you related this story as you often do, by describing the way that events unfolded to lead you to your path. And I appreciate your humble honesty in describing yourself as though you are a student of life. I can relate to that myself. Thank you for sharing this deeply personal experience and your feelings of faith, they inspire me. I can't thank you enough for your words, my friend. Truly, they brought tears to my eyes. Thank you. 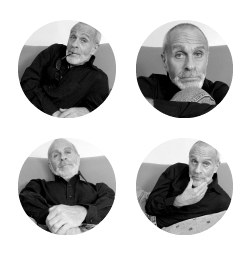 Yes, we're ALL students of life, and by sharing this I hope that I can shed some light on how my own journey and the various paths I've taken, have lead me to a better understanding of this human and spiritual experience we all share. And that, yes, we are never alone. And we are always loved. Thanks for stopping by and sharing your awesome energy. You're a sweetheart! So true .. we have to learn to know ourselves and our place in the universe. I find I'm best able to appreciate this away from all the artificial hubbub and the trappings of 'civilisation' but it's getting harder to get out there, so my personal process is learning to find it within myself despite everything, and it happens in what I can only describe as periodic episodes, some of them painful, some of them merely enlightening. Too many people, too much 'stuff', too many buildings and lights and too much noise .. we are being stifled as spiritual beings. "I find I'm best able to appreciate this away from all the artificial hubbub and the trappings of 'civilisation' but it's getting harder to get out there, so my personal process is learning to find it within myself despite everything..."
You're right. And I truly think this experience showed me that - to look inside for the answers - regardless of what's going on around me. "Too many people, too much 'stuff', too many buildings and lights and too much noise .. we are being stifled as spiritual beings." You said it, my friend. And living in a city (such as I do), that stuff is even more intense, more of a distraction. Thank you, Jay! Thanks so much for stopping by and sharing your enlightenment on this post. I so appreciated it! Blessings Ron. To be in the light, bask in its glory and know that it is only possible because you weathered the storms of darkness, is a powerful thing. The strength that comes from that is incredible. Thank you for sharing a piece of your journey. You're baaaaaaaaaaaack! It's ironic that you stopped by this evening because today while I was out and about walking around the city, I thought of you!!! It's sooooooo fab to see ya! "For me I have struggled with religion and am still very unsure where I stand on the topic." I've always believe that I can find a little bit of something wonderful in all faiths, but I've never found one that feels right to me to call myself religious so I know what you mean. Thanks a bunch for stopping by, girl! I look forward to catching up with you this week. Hope you had a great time on your vacation! Thank you so much for stopping by. Great to see ya! "To be in the light, bask in its glory and know that it is only possible because you weathered the storms of darkness, is a powerful thing. The strength that comes from that is incredible." It's funny, because I never FULLY understood light until I experienced the dark. Dark was something I always wanted to avoid because I thought it was negative. But like with all things, there's the polarity. So, I had to experience both to fully understand them. And I know that you, with all that you've experienced on your own spiritual path, understand what I mean. "Little by little gaining internal strengh"... this is exactly what I have been doing as I keep visiting family 'sans hubby', and have sweet quiet times, just for me. Hugs to you, dear Ron! Sorry about that, dear lady. I know what you mean because last night while trying to leave a comment on another Blogger blog I had the same issue. UGH! Blogger is going through ANOTHER commenting issue. But, thank you soooo much for taking the time to recomment. I did get your first comment, but deleted it. And thank you for your kind and sweet words. Glad you enjoyed. "this is exactly what I have been doing as I keep visiting family 'sans hubby', and have sweet quiet times, just for me." Good for you. We all need that time. Thank you for stopping by. Hope you're having a wonderful week!